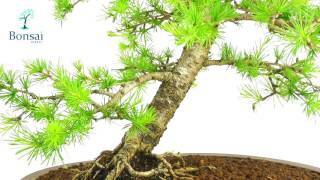 An outstanding European Larch Bonsai with the most fantastic proportions and exquisite detailing. The taper and trunk flow are superb and the nebari gently draws your eye from the pretty roots up the trunk. The branch positioning is stunning and the overall appearance is of a very well balanced and proportioned outdoor bonsai. The is absolutely no scarring on this tree, it has received the very best attention and has been hand styled. I love the larch, when droplets of water form in the leaflets it literally sparkles. Potted into a shallow oval unglazed ceramic pot, this is a wonderful overall composition. Please view the video below the main image - it shows the detailing much more clearly than the photographs. This is an incredibly well proportioned Larch bonsai with amazing branches that are beautifully positioned and full of detail. There is considerable character in the aged bark. Beautiful leaflets and detailing complete this outstanding bonsai.